Warm the new hires up before their first day. Share information and counsel them about the business, dress code, processes, and people they will be working with. This will give them a good idea of what to expect and make their first day seamless. For most of us, starting out in a new place is always a little daunting. The unknown gives an unfriendly pretext, and it’s just naturally uncomfortable. We all know how important the first impressions are, and so the pressure to charm becomes high, especially on the new hire’s end. Making the welcome, on the first day, a little warm and personal always helps. It eases the formality and encourages the new hires to be themselves. This could a be a little note on how you found their profile interesting and are looking forward to seeing them. New experiences are exhausting for most people. It is best to keep onboarding as easy and straightforward as possible. Try not to go into too many details at the start. Chances are they won’t understand them anyway, and it might distract them from more important things. Keep it easy; focus on the relationship and try to build a good rapport. Let them figure out the details. If your relationship is good, they’ll come back to you with questions. Most people fail to understand that it’s really about making relationships. The better yours is with your team, the better you will be as a team. The halls you spent years in are all foreign to them. They don’t know where the store is or where people smoke. Show them everything they need to know. If your firm is large, plan and time a tour. Don’t just show the places that they could have seen on their own; give them the insights and history as well. Not only will this make it memorable, but it will help them connect with others when they discuss old times or former colleagues. Make the tour smarter by introducing them briefly to key personnel. That may just be a name exchange and what they do. You might assume your new hire would know a thing or two about the general work attitude, but that’s not always the case. Every office has its own conventions. Tell them those little things while on tour. It’ll make the transition easy. Any company is bound to give some stationary and things to their new hires, depending on their role. Why not present some of it as a gift? That not only makes it personal, but highly active and memorable. It could be as simple as a pen or a notebook with a welcome note. In all, the process should be fun and exciting. Start their job off right by making onboarding engaging and entertaining. They’ll appreciate the lighthearted spirit. Every company has its own way of doing things, and we become so used to it, we don’t really see the need to organize it before sharing with new team members. Do not make this mistake! Learn to put yourself in their shoes. They need it all from scratch, and if it’s not in pieces that add up easily, they will be lost and confused for a long time. The best approach would be to make a list of things they will need to do to get started. This could be setting up their computer login, official email, etc. Add the names and contact numbers of the personnel they will need to get in touch with to get these things on the list done. Walk them through it once, before leaving them to figure things out. One of the biggest hurdles during the onboarding experience is simply information overload. There’s so much to learn and experience that it can be very overwhelming to bring it all together. In order to make the process simpler, onboarding should ideally be clearly scheduled and tailored to suit the individual. Even if your business only has a few employees, it helps to have a written plan for your onboarding process. Take the time to lay out exactly what you want to include and exclude. You can always add to it or adjust it over time. This way, you’ll have something concrete to follow, no matter how busy you are that day or whoever is handling the process. It will also give you a framework to improve upon as you learn which parts of your process are ineffective. Read an interesting opinion piece by Maren Hogan, a seasoned marketer and community builder in HR who leads Red Branch Media, an agency offering marketing strategy and content development. A classic mentorship program always helps new hires build confidence, perform better and get a clear understanding of team play from the onset. There's nothing like guidance from a seasoned employee to help climb and become familiar with the inner workings of an organization. We all have questions at times that we feel reluctant to ask or need to confide in people we can trust. A mentor can play this part and ensure the new hire shines with his/her real potential. Don’t scare the new hires by throwing them to the wolves their first day. It’s tempting to get your employees trained and ready to work as quickly as possible for productivity reasons, but it can also backfire and demotivate or scare them to quit. It’s always better to give them a chance to warm up to their environment. Introduce things one at a time, and give them some breathing room. Don’t exhaust them unless you want them to leave. If the new hire is taking more time than you allocated, then increase it to make space. Don’t be too quick to judge. Some of the most talented professionals may take time to adjust, and that’s fine. While they are new to the company, they are still employees and should be held accountable for their actions – including engaging in the onboarding process. You can allow some leeway, but having a standardized metrics system in place will allow you to assess a hire’s progress, as well as examine the process itself, in case it needs to be modified. By holding them accountable, you’ll set the bar for being responsible. Be sure to make this a nudging mechanism. You don’t want to push too hard, which could lower their spirits. Make room or extend deadlines where possible. When you do this, explain and encourage them positively. Some people take time when getting the hang of the new environment. Always give them the benefit of the doubt. That’s why it’s called onboarding. New hires know absolutely nothing about the way your company functions, and they may be able to look at things with a fresh new perspective. Use the opportunity to gain new insights. Encourage them to question accepted procedures and suggest improvements. This will excite them and boost their confidence. They might also have different skills and knowledge if they are coming from different backgrounds. Urge them to share this with colleagues in your office. This might be software skills or general subject knowledge (like an understanding of color theory and its effects) that might help existing employees do better. These sessions will also help develop rapport and build relationships, which are extremely vital for any successful workplace. Much of the onboarding process is about conveying information to the new hire in a one-sided conversation. However, it’s important that you spend at least some time opening a casual dialogue. 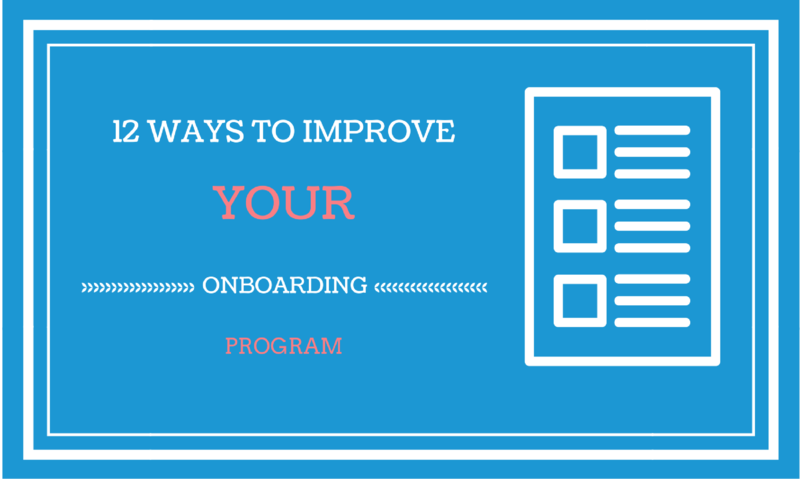 Give your new hires a chance to make comments and ask questions on the onboarding process. Be fair to explain or address them. Not only will this help you clarify some points of confusion, but it will also demonstrate that you care about them. That way they aren’t just being pushed through an onboarding assembly line.